The one process that helps sales reps turn cold prospects into hot leads is sales funnel. In fact, improving sales funnel efficiency is among the top sales priorities. It makes sense: a great sales funnel gives sales people an insight into their potential customer’s thought process, challenges, and decisions. However, as much as 68% of companies have not identified or attempted to measure a sales funnel. The same survey showed that 79% of marketing leads are never converted into paying customers. 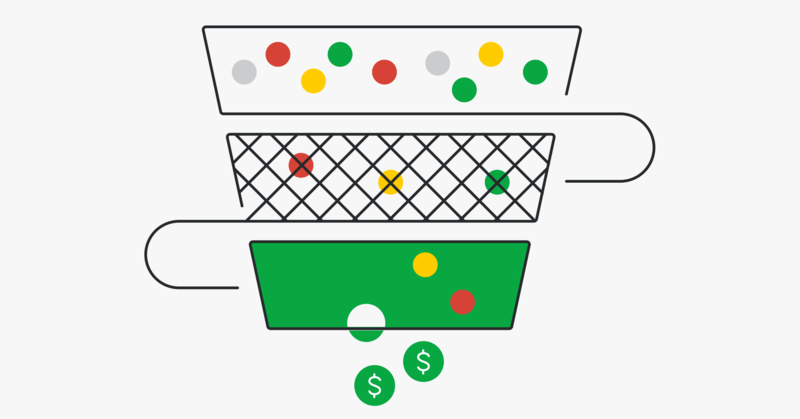 It’s certain: without a solid sales funnel, it’s almost impossible to convert leads into sales efficiently and grow sales and revenue over time. So what is it that makes a quality sales funnel? Sales funnel is a visual representation of the journey from your prospect’s first contact with you until a completed purchase. Just like its name indicates, a sales funnel is the widest at the top and the narrowest at its bottom. Each stage of the funnel pushes your most qualified prospects into the next stage and drops those that are not a fit for your offer. A sales funnel is directly connected to the customer journey phases, which can be sorted into three parts: top, middle, and bottom. This can translate into the sales funnel structure on your part as prospects going through Untouched > Contact made (Leads) > Qualified > Proposal presented > Negotiation > Won. They can scale their sales process, forecast their sales and revenue, and hit their goals. In other words, a well-defined sales funnel improves customer’s journey as well as company’s health. While each organization has its own way of managing the sales process and customer touchpoints towards a purchase, these are structured into three distinct stages. Early in their journey, your potential customers are going through a specific problem and are researching and learning about it. This early in the journey, they are still identifying their challenge. They have many questions about it as they likely haven’t named the problem itself—they just know the symptoms. At the top of the sales funnel, your prospect wants to feel educated and confident to be able to talk about their questions and problems when the time comes. From a marketing perspective, they want content that will guide them through the topic that matters to them, including blog posts, videos, and even quizzes. In this stage, your Untouched prospects turn into Contact made prospects. More precisely, they are now your Leads. It’s time for you, the sales rep, to ask relevant questions and qualify your lead, which is what brings us to the next stage. In this stage, you’re no longer dealing with nameless and faceless contacts. They have now named and defined their problem, and they are looking into all available solutions such as products and services. Questions in the middle of the funnel are no longer generic. Instead of asking ‘why’ questions, your leads are diving into a range of opportunities to remedy their struggle. At the middle of the sales funnel, you lead is diving deeper into the specifics of the problem. They understand what’s bothering them in great detail and want to know the possible solutions. At this point, they might not necessarily be evaluating solution providers such as specific companies and their products. Instead, they are looking for types of solutions available to them. For example, they have yet to decide if they will buy a software solution for in-house support teams or outsource support altogether. Another example: they aren’t sure if they just need a mattress topper or if they should buy a new mattress. The content that serves your leads best in this stage includes in-depth guides, comparison-style checklists, pros versus cons lists, and other insightful pieces. In this stage, your Leads become Qualified as you get to talk to them and ask them questions that help you decide whether your offer is the right fit for their problem. Finally, the bottom of your funnel is when your leads now know everything about their problem, the best type of solution for them, and are ready to select the provider to purchase this solution from. That’s what helps your lead make a decision that suits their exact needs, specific problems, budget, and other relevant resources. The best content for the bottom of the funnel are frequently-asked-questions pages, videos about product features, live demos, and side-to-side competitive feature analysis. These reinforce their confidence in your offer as they keep seeing its fit for their specific problem. This is when your Qualified leads go through Proposal presented and Negotiation phases, after which you ideally win their business. With this breakdown of sales funnel stages in mind, we can now look at some sales funnel examples. They will show a salesperson can guide the prospect from the moment they become a lead through to purchasing by understanding their key pain points and providing the right answers at the right time. This is where sales and marketing work in perfect harmony to attract, nurture, and impact the decision-making process of a potential customer. This is also where you can see how well your marketing funnel aligns with your sales process. Twilio offers communication APIs—a service that developers can implement to embed voice calling and text messaging into a software application or a product. They know how important it is to communicate these specifics to their audience, and they’re really good at it. Potential customers can easily find Twilio as their potential vendor by simply searching for a key term—communication APIs, for which Twilio ranks highly. They can also find them on social media, through their blog, or a self-paced game made for learning Twilio. When they’re signed up, they either end up with a free account to start with (and eventually upgrade to a paid one), or they land in a sales rep’s inbox and wait to be contacted. Now that a website visitor became a lead, the sales rep can leverage the information collected in the opt-in form, such as the company name, job title, and even the product that the lead is interested in, to drive a valuable sales conversation and ask the right questions. As they ask questions aimed at finding a product fit for prospect’s problem, the sales rep can then make the most out of the answers and concerns that the lead presents. As they do this and gauge the response from their lead, they qualify them further and help them progress down the funnel. Finally, the lead is now qualified and considers Twilio as their solution. However, they have questions about pricing, implementation, and the return on their investment. This is where hyper-specific pages such as customer stories, in-depth documentation, and use cases come in handy. The more relatable they are to the lead’s industry and scenario, the better. If the sales rep can confidently answer questions at the bottom of the funnel in full and conveys the match between the lead’s problem and the solution, they will convert the lead into a customer. Tricentis is a software testing tool with a suite of products that spans across automation, integration, and optimization. They are one of the most innovative tools for continuous software testing. It’s easy to assume Tricentis wants to be found as someone searches for a software testing tool—and they are. They actually rank highly with a guide called The Top Software Testing Tools: The Ultimate List of Lists for the software testing tools search. Because of this, they can easily build awareness with their target audience. 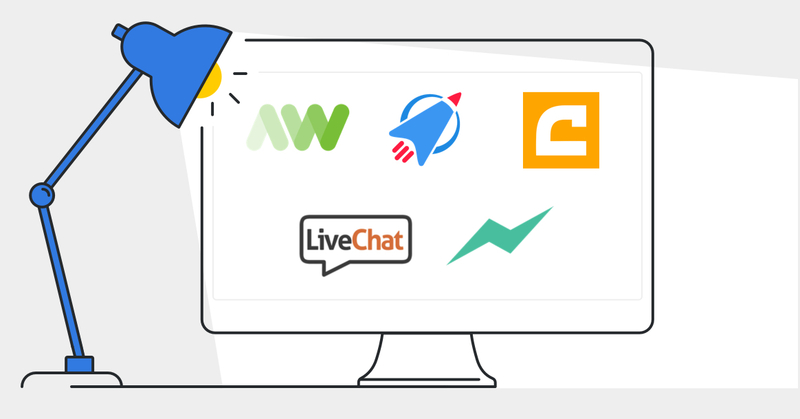 As their potential customers land on their website, they can get in touch with the company in several ways: by starting a free trial, selecting the ‘Ask an expert’ option (top right) or ‘Talk with sales’ option (bottom right). Once again, a sales rep has plenty of information about the lead, such as their job title and company name. This is a great foundation for starting a qualifying sales conversation. Furthermore, Tricentis pride themselves with a huge resource library, which means that as they nurture their sales leads, they can send them incredibly specific content for the challenges their lead is facing. Whether the prospect requires more information in the form of info packs, video demos, or in-depth guides, a Tricentis salesperson can easily provide them with everything they need and move them further into the funnel. When it’s time for a Tricentis lead to make a purchase decision, they need more information and reassurance that the product is the right way to go. This is where Tricentis sales reps can direct the lead toward their ROI calculator, their customer success stories, and even perks like their Tosca Community. Being a match for their prospect’s needs and requirements, as well as by ensuring them they’ll be properly looked after as customers, they can easily win highly qualified prospects over. Our final example isn’t a software product, but a contract metal fabrications partner called Anchor Fabrications. If that’s what you’re looking for, that’s exactly what you’ll find as they clearly optimized their website for those looking for metal fabrication contractors and communicate their message and value proposition clearly. Once they attract their target visitors, Anchor Fabrications make the most out of all pages on their website to draw these visitors further into the website and get them to take an action that will turn them into a lead. Not only do they reinforce the message by communicating client-centered manufacturing, their certifications, and the ‘Why fabricate with us’ explanation; they also offer invaluable resources for a range of issues their potential customers are facing. These play the role of a lead magnet. For example, right from the homepage, you can watch a video on benefits of manufacturing outsourcing, two guides, as well as an option to talk to sales. Even though this might be considered a lot for a homepage, they are showcasing how good they are at what they do and they hit right where key customer problems are. As you know by now, a sales rep’s priority in the middle of the funnel is to qualify the lead as in-depth as possible and offer them the guidance and expertise they need in order to build rapport and position themselves as experts. Anchor Fabrication have built an incredible resource library for this exact purpose, which they can use to go beyond just answering the questions from their leads. As they answer their questions and build up their confidence about Anchor Fabrication’s services as a possible solution, they can also spark new questions and get the lead to naturally progress deeper into the customer journey. Finally, the lead will want to know if Anchor Fabrication is the best and most reliable option they can go for. This is where the sales rep can go through their case studies and industry-specific case studies, their strategy of handling specific use cases and the results they will see and the associated timelines. Whether it’s breaking down costs, the time that will be saved, and the successful past work, it’s up to salespeople to gauge which information will help push the prospect over the line and get them to sign up for their services. And thanks to their detailed descriptions of services they offer and the industries they serve—they can do exactly that. As we hinted earlier, a defined sales funnel brings benefits both to your prospects and the journey they go through before they purchase, as well as to your organization’s health and revenue. By now you’ve noticed the amount of questions your potential customer might have before even thinking of purchasing from you. Even though these concerns may arise at a different time for each of your prospect and likely even in a different order, sales funnel helps you understand what it is they need to move them to the next step. Here are three ways this happens. A sales funnel helps you deliver the right message at the right moment. Imagine this scenario. You’re shopping for a new fridge. You have a very basic picture of what you want, so you’re not ready to buy just yet—you want to learn about benefits and disadvantages of certain models, features, and sizes. However, as you get on the phone with a sales person, they immediately jump onto pricing for their best-selling model. While you appreciate the effort, you can’t help but wonder if they even care what you need when it comes to your fridge. They just seem to be selling you what others are already buying. With a detailed sales funnel in place, including a map of prospect’s questions and details they need, you can deliver the perfect information and an aligned message to your prospects every single time—and save your future customer from the frustration of the scenario above. A sales funnel enables alignment between marketing and sales. Remember, your prospect can get in touch with you in any moment of their customer journey, whether it’s early research or late decision stage. This is why it’s crucial to align your marketing and sales efforts so that they receive the information they need even when you don’t have the ability to deliver it directly as a sales person. To accomplish this, your marketing team can leverage their online behavior, such as visiting specific pages on their website or activity within the emails they receive from you. You can then retarget them with paid ads targeted at their sales funnel stage, as well as plan future content and educational resources based on this. As a result, you will convey the right message outside of your sales conversations, too. A sales funnel creates commitment and loyalty. A sales funnel isn’t just the work on your part. As your prospect begins their research and learns about solutions, they will realize how many options they have. Especially in the early stages of their journey, they can easily switch to another solution provider and look into their offers. This is why it’s important for you to be present in the sales funnel early on and create a bond with your prospect. As they notice you’re able to address all of their concerns, they will grow to trust you and you will increase the chance of turning them into your customer. The sales funnel is a great measure of your company’s health. It gives you a clear view of the opportunities currently available to you and the entire sales team, showing you the revenue that you will make in the months ahead. In other words, a sales funnel gives you a complete overview of where in the sales cycle your money is. A well-managed sales funnel makes all of your sales efforts well organized and gives you control of your sales results. Here are some direct benefits of a high-quality sales funnel on your business. Save time by dismissing unqualified prospects and focusing on hot leads. A bloated sales pipeline can be deceiving for a sales rep. You might believe that you have a lot going on and that you’ll hit your target. If, in reality, you’re not adding new deals because of this false safety, you’re doing yourself and your sales targets a disservice. Having a solid funnel in place will enable you to dismiss bad leads early and increase your efforts with highly qualified ones—ultimately resulting in more sales and better customers. Move deals into next stages quicker. The longer your sales funnel has been defined, the more you will be able to nail down exactly what it takes to move your prospects down the funnel. This means you’ll be able to deliver this information quicker, address your lead’s concerns upfront and often even before they know they have that concern. This will shorten your time from initially contacting a lead to closing the deal. Track sales metrics that matter. To make the most of your sales funnel, it’s essential that you monitor and keep track of some key metrics in your funnel. This is another method that will ensure your funnel is healthy, your sales on track, and your time is spent wisely. These metrics closely relate to each other. For example, the number of deals in your funnel matters only if you know what percentage of your deals you win on average. The average size of a deal impacts the amount of deals you should be closing in order to hit your revenue goal. And sales velocity helps you understand how much of your time can and should go towards each quality deal, so you can manage your days effectively. We hope that with all the details and examples we talked about by now, you have a general idea of what a sales funnel means in your specific sales scenarios and for your prospect’s needs. Think through your customer’s buying process and the main decision points from your customers’ point of view. Then write down the matching sales stages for your company. It should take no longer than 10 minutes per customer segment (if you have more than one). Discuss the stages with other salespeople and colleagues. If you’re a one-person operation, ask an industry peer. A second opinion often helps you spot flaws in your plan before implementation. Spend some time reviewing whether your sales pipeline stages match your typical sales scenarios. Review the final stages with others (if you have a team). Make sure everyone understands the aim of defining sales stages and agree on measuring activities at each stage. Revise the sales stages in a month or two. If a stage seems to be confusing, then rename, delete or add new ones to reflect what’s really happening with your sales pipeline. The key here is to understand the thought process of your leads in moments when they are moving into the next stage of their purchase journey. For example, what does it take for them to register for a free trial? Download an eBook? Sign up for a live demo? And ultimately, give you their money in exchange for a solution? And on the other side of the story, find your own key activities that help them achieve all the milestones you listed above. Is it an email packed with resources? A call for you to answer their questions? A specific type of deal you can offer? Answer these questions and you’re good to go. A leaky sales funnel is frustrating, but the good news is that there are simple ways to deal with it. Revisit your sales funnel from lead to close. Earlier in this guide, you’ve already mapped this out. Now, it’s time to think about potential flaws in your system that make it hard for a prospect to do business with you. It’s too easy for companies to sacrifice customer experience for internal process. Make sure that you break down barriers and make it easy for prospects to engage with you at every stage. Review your initial lead response time. According to InsideSales.com, 35-50 percent of sales go to the vendor that responds first. Speed literally wins deals! The time it takes for your company to respond to leads once they hit their inbox may be the first source of a leak, so make sure to review this and make time in your day for prioritizing responding to leads. Identify why prospects are disqualified. One of the overarching benefits of having a sales funnel is delivering the perfect message right when your prospect needs it. So if your funnel seems leaky, it’s time to learn about the leads that aren’t working for you. Make sure they fit your ideal buyer persona, and if so, why did they not show interest in your company? There might be reasons such as pricing, market immaturity, or a too-long product implementation schedule—make sure to dive into everything that might be the reason. The more deals you work on, the easier it is for them to slip through and go cold. Keeping an eye on all of them at once can be a challenge on its own. This is why it’s crucial to implement a system that relieves you from having to remember to look at each individual lead. 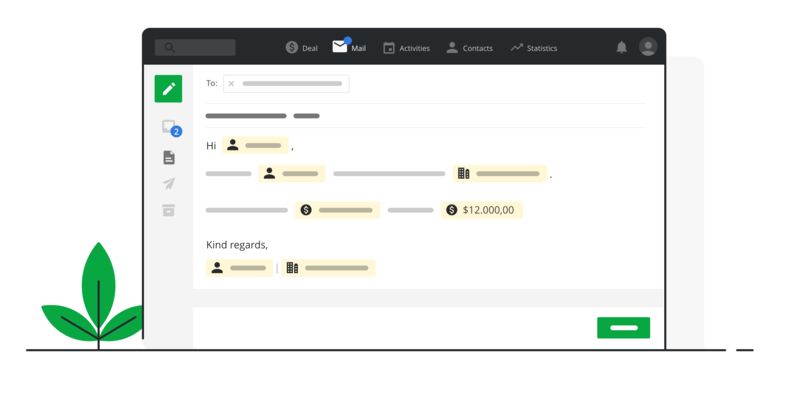 A great system will give you a visual overview of what’s happening in each of your sales funnel stages, as well as send you reminders for key actions to take and move the deal forward. After you’ve defined your sales funnel in an earlier step, take the time to transfer your sales funnel stages into your CRM—and if you’re not using one already, make sure to choose one that makes you more productive instead of adding unimportant tasks to your schedule. Does your CRM help you focus on most important activities? Are you able to see everything that’s happening in your deals? How does it allow you to stay organized? Remember: only a CRM tool that actually makes your deals move at a higher pace and with better quality leads is the one that will make a positive impact on your organization, so take your time to understand what your sales funnel requires. With your potential customer’s pain points and questions in mind, you can now map out and implement a start-to-finish sales funnel that will make you a more efficient sales person. With this in mind, you’re ready to make the most of your sales process and build lasting relationships with your future customers.